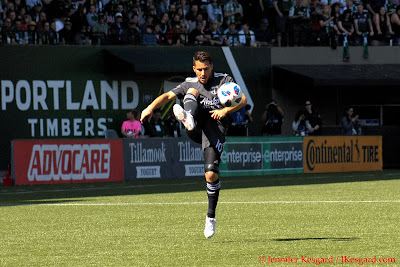 Sebastian Blanco has been the MVP of 2018 for the Timbers in my opinion. 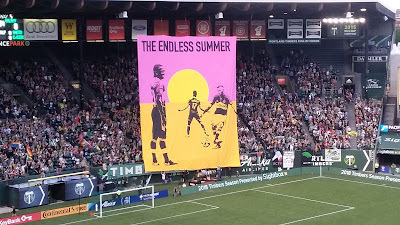 Friday nights are odd at Providence Park, especially considering many soccer fans had spent most of their day watching action from the 2018 World Cup in Russia. With Major League Soccer on their annual summer break, the Portland Timbers were looking forward to a break in play from their last league match (a draw versus Sporting Kansas City on June 9) and a road date in Atlanta to play former Timber Darlington Nagbe and his new side, Atlanta United, on June 24. However, the club would get an opportunity to keep sharp during the off time courtesy of the 2018 U.S. Open Cup tournament. After knocking off San Jose in their opening match on June 6 at home (MLS teams joined the single elimination tournament in Round 4 of the winner take all competition to crown the best soccer club in the U.S.), Portland would play their Round 5 match in the friendly confines of Providence Park against a team they've grown familiar with in 2018, the Los Angeles Galaxy. 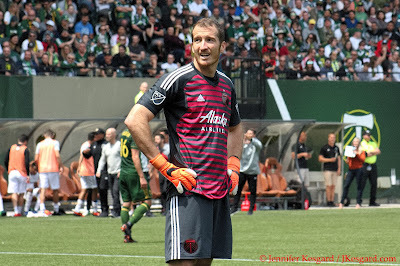 After losing to the Galaxy to start the 2018 MLS season back in March on the road and playing to an uninspired draw just 13 days earlier in Portland where Timbers Coach Gio Savarese lamented wasted chances, the Timbers finally got some revenge behind an inspired defensive effort, timely saves from goalkeeper Jeff Attinella and a wonder strike from Sebastian Blanco in the 30th minute to secure a 1 to 0 victory. 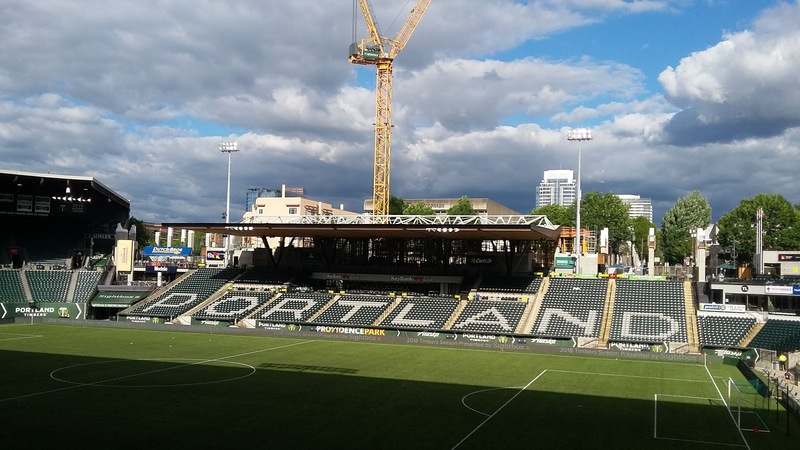 Portland now awaits the winner of the Sacramento Republic - Los Angeles Football Club match midweek to know who they will play and where, since the Republic - LAFC winner will host them on July 18th in the USOC Quarterfinals. When talking U.S.t Open Cup history and the Portland Timbers, those words combined can invoke several different, stark memories - from heart wrenching losses to a certain team up North, a volcanic meltdown by the same team in one of the most dramatic results at Starfire Sports Complex, some baffling losses and solid victories. In playing a single elimination tournament where a winner must be crowned each round without replays, odd breaks and emotional moments are par for the course in this tournament. Portland has also had a history of playing early round matches away from the Rose City, so being able to play their first two matches in front of their home fans is truly special. With the stadium expansion project already impacting the home side of fixtures, Timbers fans appreciated the extra chance to see their favorites play outside of MLS play - with over 14,000 fans filling the west, north and south decks of the park. With all the energy from the crowd, it would be up to Savarese to figure out a master plan to break down the Galaxy - something that he wasn't able to do in their June 2 meeting at home and only late in the March 4 opener due to handy work in the second half from Blanco and Diego Valeri. Stadium construction meant another match with no Eastside crowd. Savarese decided to roll the dice, considering that Valeri had played in every MLS league fixture so far in 2018 and a rough 2 match road trip looming after the schedule break, and Gio let the Maestro sit this one out. Offensively, Savarese made the choice to play a more traditional 4 defender, 4 midfielder and 2 forward attack - which hadn't been done in league play yet, but was used in the pre-season to some success. Samuel Armenteros was a huge thorn against the Galaxy 13 days ago, and for this match, he would get the start alongside Fanendo Adi as the strike duo. Blanco, who has been a big catalyst for the Timbers all year, would be pushed out wide as an attacking midfielder alongside Andres Flores, Diego Chara and Lawrence Olum. In this formation, it would be up to Chara and Olum to patrol the middle and frustrate the Galaxy while funneling the ball out wide to their wings. With Attinella entrenched in goal, Savarese would use Zarek Valentin, Vytas, Larrys Mabiala and Bill Tuiloma as the defensive line. The last time the Galaxy saw Tuiloma, he was playing the right back position, but this time, he would tasked with supporting Mabiala and marking the box for attackers. With USOC rules restricting the game day 18 to just 5 foreign players allowed (green card holders are considered national), Savarese had a youthful bench of goalkeeper Jake Gleeson, defenders Modou Jadama and Alvas Powell, midfielders Eryk Williamson, Dairon Asprilla and Cristhian Paredes and forward Jeremy Ebobisse. Galaxy Coach Sigi Schmid used a very similar lineup to the one used for June 2, but much like Savarese, the 5 foreign player limit hampered some decision making. The team's big signing for 2018, forward Zlatan Ibrahimović, was in Russia doing promotional duties for World Cup 2018, but Schmid used goalkeeper David Bingham and the same defensive foursome - Ashley Cole, Michael Ciani, Jorgen Skjelvik and Dave Romney. It was Skjelvik's penalty against Flores in the 54th minute that gave Portland their only goal in the June 2 draw, but he's been otherwise stellar in solidifying a defensive line that was simply miserable in 2017. Servando Carrasco and Perry Kitchen would again be the defensive midfielders for the Galaxy, with attacking midfielders Bradford Jamieson, Chris Pontius and Emmanuel Boateng flanking out in the attack. Ola Kamara, the Galaxy's other big signing for 2018, was out on international duty for the June 2 meeting, but for this night, he was the sole striker. In their opening round USOC win, the Galaxy relied upon great play from Jamieson and forward Ariel Lassiter to advance, and Lassiter would be available as a sub in this one. In their last meeting, the battle between Chara and Kitchen led to several fouls and contentious moments, and the caution Diego received in the first half triggered a one match suspension for accumulation. Timbers Army tifo with a theme for 2018. Yes, I hope summer never ends. In a rare change of sorts, I was able to produce a match recap for the official USOC site, thecup.us, to cover the main events of the night. I've been a big fan of the site's work over the years, so for me to be able to contribute to it in some small fashion is a true honor. To add some thoughts to that post, it was a very active Armenteros that kept the Galaxy busy early with a near miss in the 11th minute. Chara and Tuiloma both challenged Bingham in the following 2 minutes, but the player of the first half was Blanco with 5 shots in the first 45 minutes. While 2 of them were blocked, it was Blanco's 30th minute tally that ended up being the game winner. Valentin was playing wide right and put a cross into Adi towards the right edge of the box, and Fanendo put a back heel right into Blanco's path on the right. Sebastian moved over to the left quickly on the dribble, but once he had space, he punched a shot back left that the Galaxy defense and Bingham couldn't stop, and the Timbers had the early lead. The Galaxy mustered just 2 shots on target for the half, with a Kamara miss in the 39th minute and a header from Skjelvik off a stoppage time corner kick that Mabiala headed clear of goal with Attinella pulled away by the defense. Statistically speaking, the sides played fairly even in terms of chances and possession, but the Timbers were more purposeful with their shots and challenging Bingham. The second half had plenty of back and forth action, but honestly just two huge chances between the two sides. Armenteros struck the woodwork in the 55th minute off a cross from Valentin with a great one time shot, and he had 2 other near misses for his 90 minutes of work. The Galaxy had a shot from Pontius pulled wide of the right post in the 73rd minute, but their best effort of the night was a missile from Lassiter in the 89th minute. Carrasco dropped a pass in traffic to Lassiter just outside the box, and he put a laser on target, but Attinella leapt at the last second to push the shot over the bar to keep the Timbers on top. While the Galaxy had the overall advantages in possession and passing accuracy on the night, the Timbers were able to generate more quality shots and put more pressure on the Galaxy backline. This became even more apparent in the 75th minute when Asprilla replaced Adi and the Timbers went into more of a 4 - 2 - 3 - 1 formation with Chara and Olum staying home, Asprilla, Blanco and Flores shifting out wide for the attack, and Armenteros working as the lone striker. Showing versatility and adaptability in the attack was good to see from the Timbers, and showing some different wrinkles from the Christmas Tree formation where the Timbers have seen success should keep opponents from banking on what Portland will do from match to match. I picked Blanco as MOTM, but Jeff Attinella was a very close second. It was also great to see Adi and Armenteros play so well off each other; Adi's hold up play and passing was a key component for the offense, while Armenteros' energy and power really opened up space against the Galaxy backline. As well as Blanco did with the creativity in the offense and having Chara back to anchor the midfield, it bodes nicely to see the Timbers be able to attack the goal with Valeri sitting and Andy Polo off in the World Cup for weeks. Complacency is a big problem in MLS, so watching Savarese change up the focus with different players and formation and still having success on the pitch is huge for Portland as they turn their focus towards the next few weeks after the international break: June 24 in Atlanta, June 30 in Seattle, July 7 versus San Jose, July 15 at LAFC, July 18 USOC match at either LAFC or Sacramento, followed by 4 consecutive home matches against Montreal, Houston, Philadelphia and Vancouver. 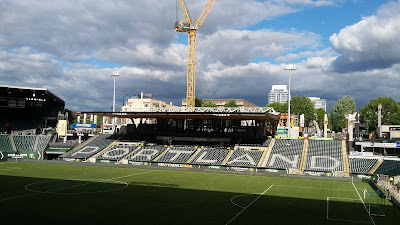 It's going to be very busy for sure, but from what I've seen from the Timbers and Savarese, they seem more than up for the challenges presented to them.